On Saturday March 31st, Detroit PAL hosted the Recreation League All-Star games, which were held at Northwestern High School. 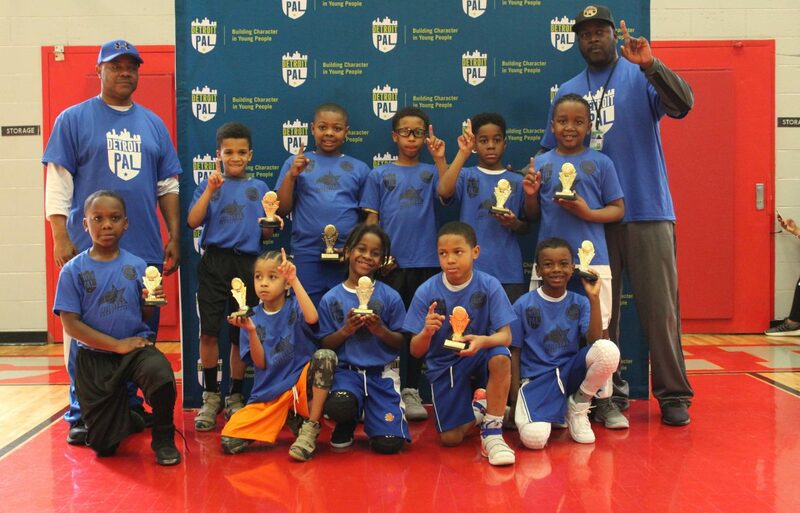 All stars from the league, ages 8-16, got to showcase their talents on Saturday. There were five games played in total. There was the 8 and under, 10 and under, 12 and under, 14 and under and 16 under all star game. You had the east battling the west in each division. Friends and family came out to support the youth and see PAL’s top basketball players in action. There were some very intense games which came down to the last shot. Click here for pictures from the event. Let’s take a look and see how each game played out. We had the 8 and under boys in action during the first game and it was a sight to see. Both teams were fighting for baskets in the first quarter with the score tied at two. When the second quarter came, the East was able to capitalize on the offensive side and their defense came up big as they did not allow the West to score in the quarter. The East took a 6-2 lead going into the half. The East didn’t look back once the second half started. The added to their lead after the third quarter going up 11-4 and that would end up being the final score. Braylon Tigner was the leading scorer for the game, as he led the East with four points matching the total points for the West. Following the 8 and under game it was time for the 10 and under kids to play some ball. The West took control of this game and once they got a lead, they did not give it up. The West jumped out to a 10-6 lead after one with the help of Justin Ghee who had six points in the first quarter. In the second quarter the East looked for ways to cut into the deficit but found themselves trailing by four once again. After one half, the West had a 14-10 lead. During the second half, the West continued to dominate and take control of the game going up 18-12 after the third. The East would try to make a comeback but the West always had an answer for them. The West took this one 25-18. Justin Ghee finished with eight points and Rashad Jones had seven points for the West. Jacob Wolfork, Geon Hutchins and Cortez Buchanan each had four points for the East. The 12 and under game was one for the books as both teams needed more than four quarters to decide a winner. In the first quarter, the West started off real slow, missing shot after shot. But towards the end of the first the West was able to knock down some shots and took a 7-5 lead after one. The second quarter was the East’s from start to finish. The East came from behind and took a 19-13 lead at half. James Phillips had a strong first half for the East with six points to help contribute to the lead. This was a back and forth game as both teams were trading leads. In the third quarter, the West turned it around and took a 23-19 lead going into the fourth. Just when the West thought they had the game won, the East stormed back to tie the game up at 27 with 35 seconds left to go in the game. The West had a shot to win it but could not convert. Both teams headed into overtime tied at 27. In overtime, the East took control going up 33-27, but the West was not going down without a fight. With about four seconds left the West was down three and had a shot to tie the game with a three pointer. With how this game was turning out you know what happened, the basket was good and we were headed into another overtime with the score nodded at 33. In the second overtime it was sudden death with whichever team scoring first would be the winner. The West had a shot to win it but missed a mid-range and the East came down in transition and shot a three to end it and…………….IT WAS GOOD!!!!! The East won an exciting one 36-33. Anas Newman was the leading scorer for the East with 12 points and Kamron Gouch led the West with 10 points. Following a very intense game before, the 14 and under all-star game was just as exciting as the 12 and under game. The East took a 10-7 lead after one quarter and ended up holding onto the lead going into the half at 20-14. The East did not trail the entire game as they were up 29-26 after three. But the fourth quarter was a different story. The West battled back and was able to take their first lead of the game at 30-29. But the West couldn’t hold that lead for the long as the East was able to force a few turnovers on defense which turned into easy fast break points. The East regained the lead at 34-32 with 1:48 left to play. The East had a chance to ice the game with two free throws but only made one going up by three. The West had a chance to force overtime and sure enough as time expired the West hit a three pointer. Another overtime game to be played. Being down the majority of the game, the West was able to come out victorious as they won 38-37 in a nail biter game. Tay-Shaun Massey-Johnson led the West with 12 points and Justin James had 11 points to lead the East. In the final game of the day, the East took control and dominated the West from the first to the last quarter. The East could not miss a shot, especially from behind the arc. The East took a commanding 19-6 lead after the first quarter and it did not stop there. At the half the score was 36-17 as the East was running away with this one. The West did not have an answer for the East on offense or defense and the East was just having their way during this game. After three the East were up by 35 points at 60-25 and they would end up winning by 36, blowing out the West with a final score of 78-42. Three players scored in double digits for the East as Andre Watkins Jr. finished with 14 points, Devaughn Brown had 18 and Devon Johnson had 15. The West was led by Jason Grant who had 17 points and Davaughn Gray who had 13.